TRX Exercises target the core. TRX suspension trainers are ideal for working out your core. In fact every TRX exercise requires the user to engage their abdominals, hips and low back muscles so that they can leverage their own bodyweight as resistance. Set the TRX straps to mid-calf length. Come down to your hands and knees to place both feet into the foot cradles toes first. Place your hands on the ground settle your shoulder blades into your back, make your torsos stiff, and keep your glutes strong as you lift into a plank position. Do not let your hips sag toward the ground. Hike your tailbone up toward the ceiling as you pull your right kneed into the chest. Than switch legs. Alternate pulling your one knee toward your chest at a steady controlled pace. Keep you torso and belly stiff. Exhale, move both knees toward your right elbow and contract the right side of your abdomen tightly. Inhale, extend your legs behind you into full plank. Without pausing, bring the knees in toward your left elbow. 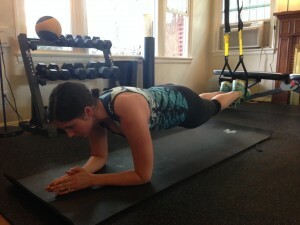 Put the TRX straps in single handle positions at the midpoint length. Face the anchor point and use both hands to grip the handle. Lean back against the TRX with arms extended and core braced. Do not sag your hips or arch your back- keep the spine neutral. Exhale and rotate your trunk and allow your arms to follow the rotation to the right and up- so that the hands end up above the right shoulder. Inhale as you return to position #3 with control and than rotate to the left. Exhale, keep your torso straight and hinge at your hips as you reach your tailbone up toward the ceiling. Inhale, lower your hips slowly back to the starting plank position. Be sure to keep an engaged core. Don’t allow your hips to sag.